Berkshire Hathaway will acquire unowned stake of railroad in a cash-and-stock deal worth $44 billion. 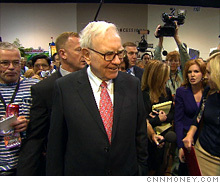 Buffett called Berkshire's acquisition of Burlington Northern an "all-in wager" on the United States. NEW YORK (CNNMoney.com) -- Warren Buffett's Berkshire Hathaway said Tuesday it will buy railroad operator Burlington Northern Santa Fe for $44 billion. Berkshire (BRKA, Fortune 500), which already has major stake in Burlington Northern, said it would acquire the remaining 77.4% of the company in a cash-and-stock offer worth $100 per share. Widely regarded as both one of the world's richest men and the investment community's more brilliant minds, Buffett called his firm's investment an "all-in wager on the economic future of the United States." "Our country's future prosperity depends on its having an efficient and well-maintained rail system," Buffett said in a statement. Burlington Northern (BNI, Fortune 500) shares soared 28% in morning trading on the news. Separately, Berkshire said it was announcing a 50-for-1 split of its Class B common stock. The majority of stock issued by the company in its purchase of Burlington Northern will be its pricier Class A shares, the company said. The deal, which would rank as the largest acquisition in Berkshire Hathaway's history, would also include $10 billion of Burlington Northern debt. It would also expand the already massive portfolio of companies Berkshire already owns. Brand-name businesses such as auto insurer Geico, See's Candy and Fruit of the Loom are all subsidiaries of the Omaha, Neb.-based firm. Matthew Rose, Burlington Northern's chairman and CEO, said the sale of the Fort Worth, Texas-based firm was a "strategic fit" for both the company's customers and employees, during a conference call with investors Tuesday. No management changes are expected at Burlington Northern as a result of the deal, which is expected to close sometime in early 2010. Berkshire's purchase, of course, will require the approval of shareholders and will have to undergo regulatory review by the Justice Department.